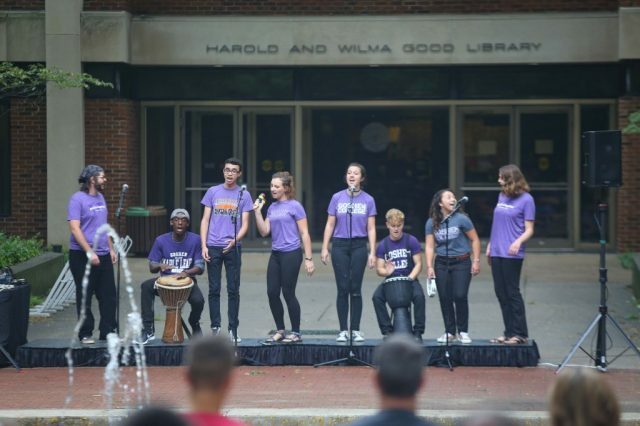 Every year, a group of Goshen College students forms the small worship ensemble Parables — an auditioned musical group which tells biblical stories and themes through song, testimony and theatrical skits. The 2018-2019 Parables group is made up of sophomores Lisa Rosado, Emmy Rupp, Stephen Lowe, Bek Zehr, Kailey Rice, and Josiah Phiri, and juniors Elijah Lora and Abigail Greaser. They work alongside Marcia Yost, director of arts at GC, who helps coordinate events and schedules for the Parables group. This year’s theme, “I am Searching…,” is conveyed through a program of music and skits which presents questions and ideas about faith and the church. The focus of the program is the personal journeys of faith experienced by each of the members of Parables, as well as their journey together as a group. In August, the students came together for the first time and worked long hours to create a program that would best suit each member’s strengths, while at the same time presenting questions to the audience as an invitation to think about their own faith journeys. With some guidance from Marcia Yost, the Parables group was able to tap into their creative sides by having the freedom to create and organize their performance as they wanted it and to display the message that they came up with as a group. The students designed their whole program, including coming up with a theme, selecting their music for the program, and arranging it to fit their style and match the flow of their story. Parables’ first performance will be on Wednesday, September 19 at 7:30 p.m. in Rieth Recital Hall. Other performances include presentations of their program at several churches of different denominations and high schools around the area.